"Frogs, snails, and puppy dog tails; that's what little boys are made of!" 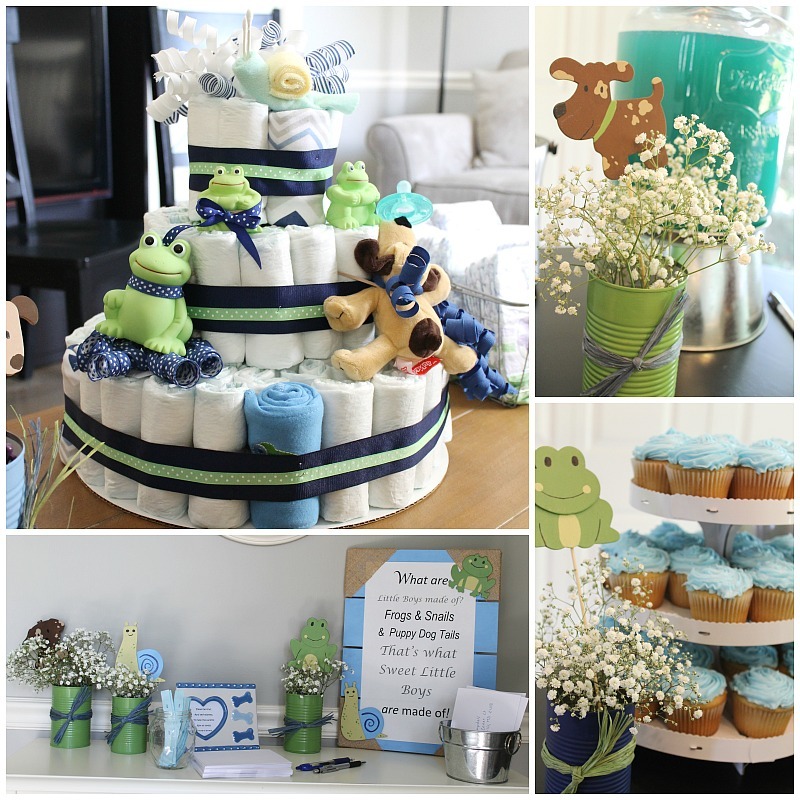 The colors were baby blue and light green and looked so cute together! I sat in this rocker to open my gifts. Above it is a banner which my mom called "ages and stages." It had photos of all the boys in the family at different stages in life, from baby to adulthood! It included my brothers, my nephews, and my husband! Such a cute idea! 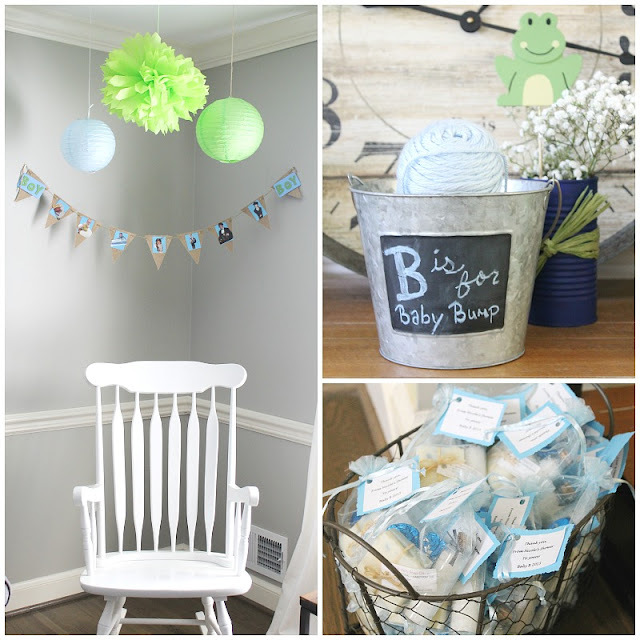 The bucket of yarn is for the infamous shower game where guests estimate the mom-to-be's belly size by cutting a piece of yarn to wrap around her belly. I definitely got some good laughs out of this one! Two of my closest friends ended up being tied with their yarn pieces being almost exactly the circumference of my belly! For party favors, my mom, sister, and grandma put together little bags of bath salts, handmade soap from Wild Herb Soap Company*, and of course chocolate! Is that not the cutest diaper cake you've ever seen?! My sweet friend Maria made it! It fits the shower theme perfectly and I love every piece of it! Maria came by early to help set up and decorate, and I'm so glad I got to spend some time with her before the shower! For decorations, my mom and my sister worked hard on crafting these cute little vases! They painted aluminum cans in blues and greens and tied rafia around them. They painted little wooden frogs, snails, and puppies to put in them along with some baby's breath flowers. 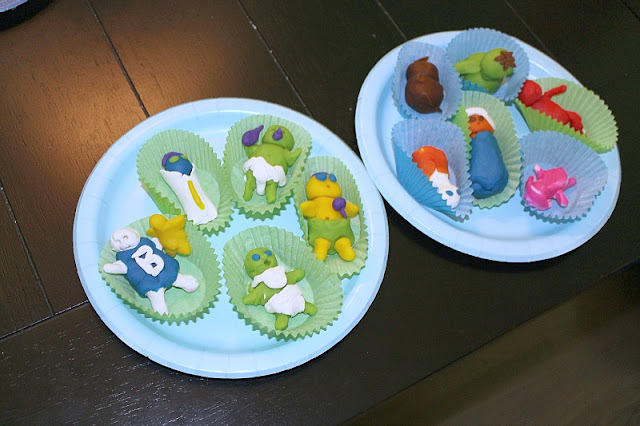 I think they turned out so adorable!!! They also set up a station for guests to pre-address envelopes for thank you cards which really made things so easy for me!!! 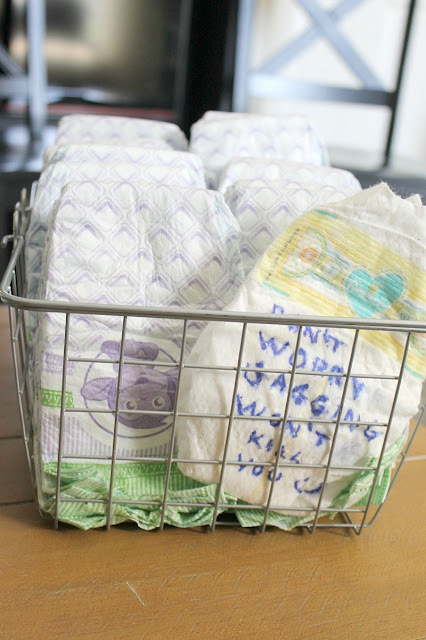 In lieu of a "guest book," friends and family wrote encouraging or funny messages on diapers. I made sure to store these in the bassinet next to our bed for some late night giggles when we are caring for the little guy in the middle of the night. My friends and family stocked the little guy's library! 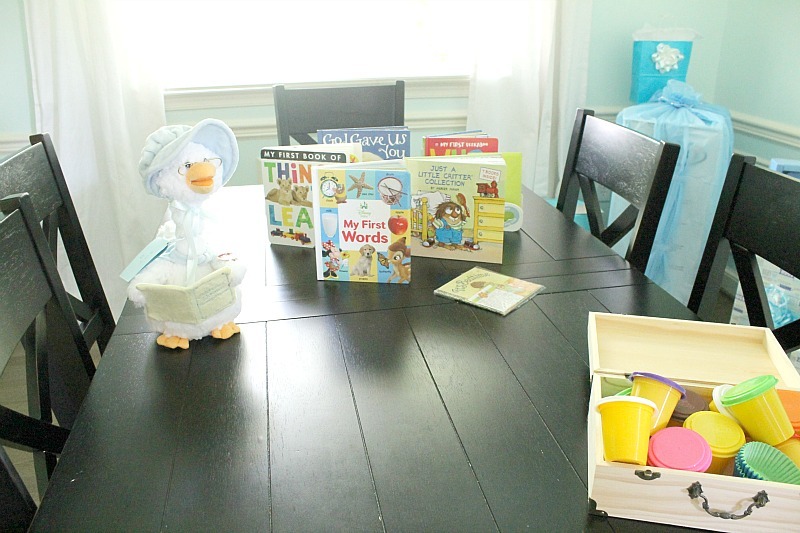 By the end of the shower, the dining table was covered with books! A book raffle was held too; for bringing a book, guests names were put in a jar and prizes were drawn. That playdough in the corner is from my new favorite shower game. Guests had to create babies out of playdough and I had to pick the winner of the best baby! Aren't those babies hilarious?! 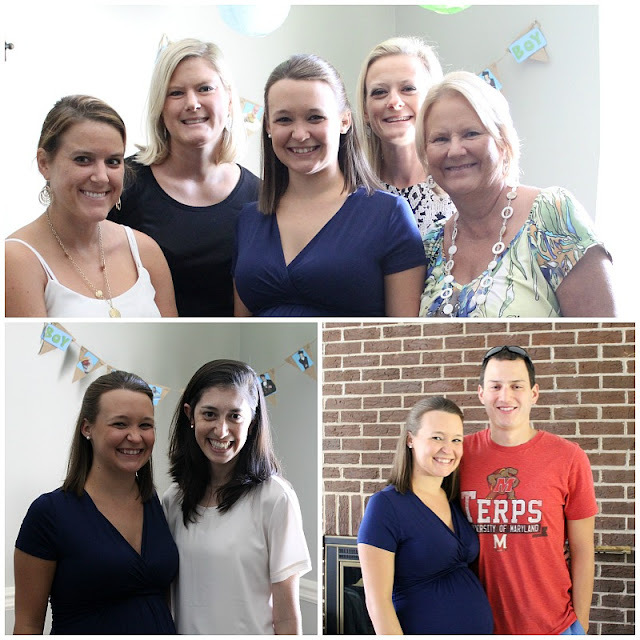 There were several plates full of babies, and I really had a tough time choosing the winner! I was impressed with how creative some of the babies were!!! Another one of my favorite parts of the decor was this chalkboard welcome sign! My sweet friend Jenny is so good at hand lettering!!! And of course, some photos of all the people who made this all happen! My wonderful mom put so much time and effort into putting my shower together! I was also thrilled that my grandmother was able to come visit from Alabama to celebrate with us! My sister helped mom with crafting, decorating, and food. I'm so glad I got to spend the weekend with these three wonderful ladies. I don't know where I would be without them!!! All of Pete's sisters and his mom pitched in too! They brought so much amazing food! Yum! Aside from all of them being talented in the kitchen, I am so blessed to have married into such a wonderful family! They are all truly so sweet and I feel so special to be a part of their fam! My friend Maria was sweet enough to volunteer to help out before the shower even though she had a wedding to go to during the shower. 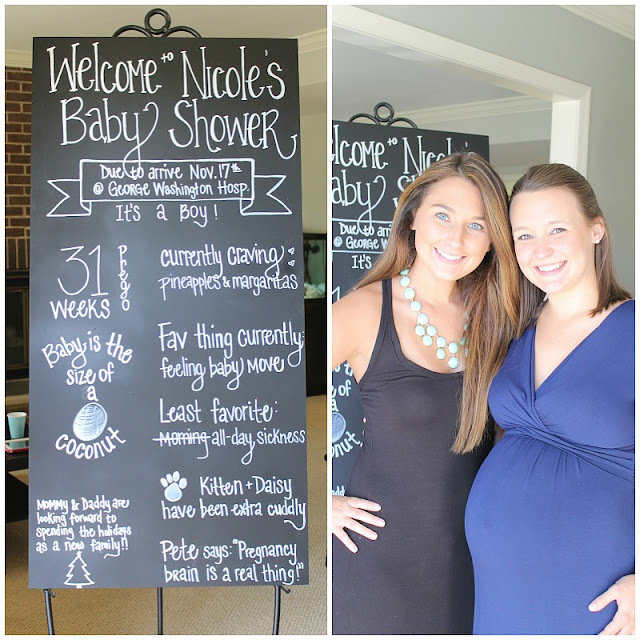 This girl has been such a good friend to me over the past few years, but especially during this pregnancy! 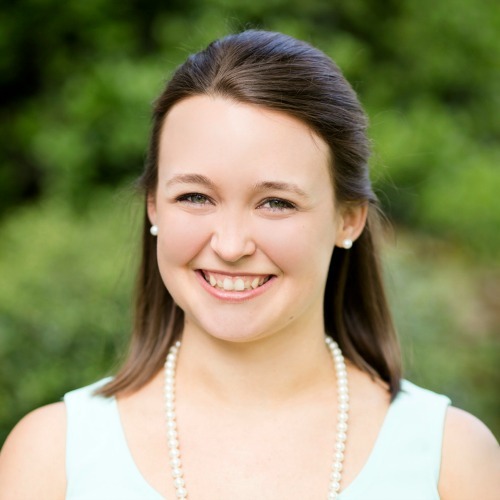 She's done so much for me! I can't imagine life without her and I'm so excited for our babies to be meet and be friends very soon! Before the shower started, my sister and I snuck outside for a few minutes of quiet time and she snagged a few bump photos for me. I was really bad about capturing the growth of this belly during pregnancy, so I'm really glad she was able to get a few great shots for me! 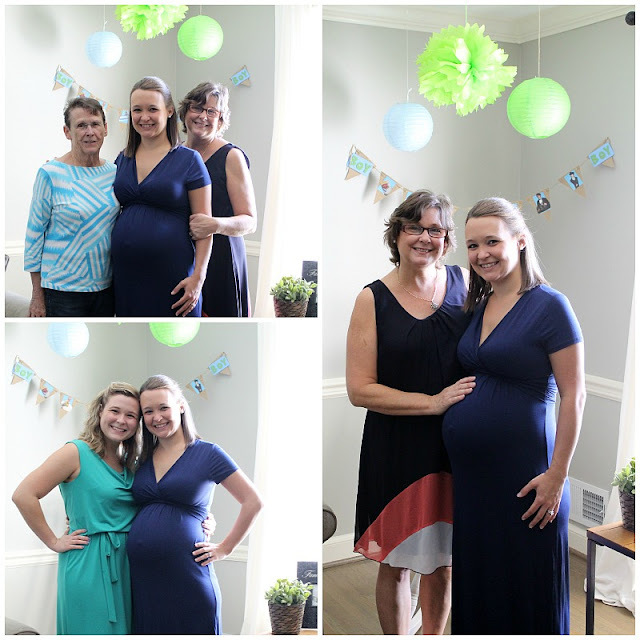 Overall, my baby shower was better than I could possibly have imagined! The theme was perfect with the cutest decorations! And it was so nice to celebrate and spend time with all of the important women in my life! We are so blessed to have such wonderful friends and family and can't wait for little one to meet them all!!! Oh my goodness Nicole! This is just the sweetest!